With Australian Mark Webber (pictured) among the leaders in the 2011 Formula One series, it gives us spur to ponder the impact this global sport has had on our ordinary road cars over the years. 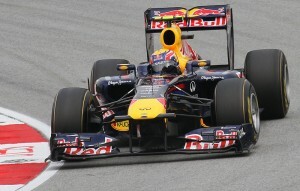 Webber recorded the fastest lap at Abu Dhabi this month and is fourth overall. Ever wondered why brakes work better now or why your new car uses less petrol and yet is more powerful than your old car? The chances are Formula One racing may have had a hand in these and other advances. Ever since car companies started making cars they were drawn into racing them to test their products in competition. The F1 World Championship is the pinnacle of motor racing and the only global competition run by motor sport’s world-governing body. It is run over 18 races in 18 different countries all over the world. It is a sport steeped in history, glamour, technology, danger and excellence. Drivers have been killed pushing the technological marvels beyond their capacities. But this has brought many safety advances to road cars, probably saving thousands of lives. Technology gains are driven relentlessly forward every week by global automotive giants in partnership with F1 teams. The teams’ huge sponsorship budgets allow cutting-edge, risky innovation. This is a race born not only of sporting glory, but huge commercial pressure from sponsors and car makers to succeed. Only war, a space program or an arms race between great powers speeds technological development faster. Ford, Mercedes, Renault, BMW, Honda, Bridgestone, and many others have developed and tested their technology in this never-ending competition. New parts are often flown in at the last minute to a race track on the other side of the world to make a car 0.2 seconds faster that weekend. If the car carries less fuel it means less weight and faster times. An extra litre of fuel weighs a kilogram slowing the car about 0.2 seconds per lap. Pressure to reduce fuel consumption and engine weight has resulted in massive improvements in engine fuel efficiency as well as increases in power in smaller engines. Manufacturers competing in F1 transfer technological innovations into their road cars. BMW sport spokesman Jörg Kottmeier said competing in the world championship had driven huge advances in design and technology. “We worked on a dedicated F1 foundry, developed leading edge casting technologies with ultra-precise process management yielding lightweight components with very high stiffness,” he said. Today, this light alloy foundry produces high-tech road-car components. “Carbon fiber was first used in F1. In 2013 BMW will introduce the Megacity, the first mass produced car with a carbon-fiber body. ATTWilliamsF1 [STAT] Team technical director Australian Sam Michael said racing has pushed road car design in many areas over the last 50 years. “The disc brake spent many years with problems before being sorted out in motor racing in the 50s,” he said. “F1 is all about making the impossible happen. Short term is overnight. In the road car manufacturing it is months or years. The latest new technology being developed under this pressure is the KERS system. A kinetic energy recovery system stores energy created from braking (stopping) and stores it to propel the car forward later. WilliamsF1 is working to transfer this clean energy technology being perfected in F1 into road cars. Mr Michael said a single “braking event” in a F1 car stores about 70KJ of energy which translates to about 80 extra horsepower to use later. “The system has already been installed in a Porsche with some success and is being developed for wider applications such as mass transit and lifts,” he said. Development of hybrid vehicles has benefited, according to BMW’s Jörg Kottmeier. “On the environmental side, KERS has pushed the envelope and provided invaluable experience in hybrid power train solutions gave today’s hybrid and electric vehicle projects a big boost,” he said.